Post-Labor Day autumn blues are setting in. Don’t get me wrong, Fall is my favorite season and I’m itching for cooler weather, comfy sweaters, and bowls of steam-swirling stew. But I’m reluctant to say farewell to fresh basil and vine ripe tomatoes and juicy corn on the cob. While I don’t consider most summer dishes to be “comfort food,” there’s definitely something comforting in the fresh ease of preparing a meal based out of one’s backyard. So autumn, yes, I’m ready for you to settle in, but summer–you’re going to be missed. As one of my last homages to the delightfully delicious, basil and tomato and zucchini (although no zucchinis in this recipe!) laden summer that I’ve had, I give you the Tomato Basil Polenta Stack. As I’ve said before, you just can’t go wrong with tomatoes–ripe, green and fried, or sun dried–and you certainly can’t go wrong with polenta. It’s just the most versatile dish! These stacks are simply layers of fried polenta, fried green tomatoes, and fresh heirloom tomatoes, all sliced and stacked up. 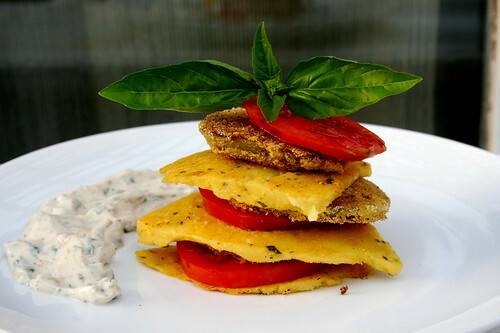 Served with a basil remoulade of sorts, the dish sums up my favorite parts of summer: smooth and soothing basil, fried foods, and tangy tomatoes. Hopefully next year we won’t be battling a blight and my garden plot will overflow with tomatoes–I’m afraid I’m already dreaming of next June. Mix together all ingredients. Serve with the tomato polenta stacks and refrigerate any leftover sauce. Stellar mix of ingredients in that dish! That looks like it came straight out of a gourmet restaurant! This is gorgeous – a perfect dinner for a date I love finding new ways to eat fried green tomatoes. fall is also my favorite season – but i’m with you in the fact that i’m gonna miss a lot of this summer produce. the tomatoes i shall miss the most, fo ‘sho! gonna have to celebrate the end of summer by making your tomato basil polenta stacks, Jes – they look amazing & the remoulade sounds glorious! Sounds delicious! Can you not bring the basil in for the winter, though? Just throw it into a pot and put it on the windowsill – it may not be so tasty during the winter (it gets a bit licorice-flavored) but that way you’ll have a head-start next year. What a beautiful presentation, Jes. And what perfect flavor complements!